SISKIYOU COUNTY, Calif. — The narcotics officer stood on a windswept ridge near the Oregon border and surveyed the fields cut into the hills below, a landscape resembling a lost piece of wine country. More than 1,500 Hmong farmers in the past two years have poured into this remote county, so vast it encompasses two western mountain ranges. County officials don’t buy it. They say that Siskiyou is being forced into the nation’s $49 billion black market for marijuana, sparking a modern range war. Satellite images in 2014 of the fallow development, with its 1,641 lots and mostly absentee owners, showed a few houses, some rusted junk and two marijuana patches. Lee’s house, unusual because it is a permanent structure, sits in the center of the 2 1/2-acre plots dedicated to growing marijuana. Six cars and three water trucks are parked out front. Lee is a child of the Hmong refugee camps in Thailand. He said he worked in Fresno as a computer programmer and contractor before joining the migration to Siskiyou County in 2016 to build the small wood sheds that growers live in. Public records show Lee and a relative, Vince Wavue Lee, tracked down the absentee owners of more than 50 lots, paid them above-market prices, and then transferred the properties as “gifts” to other Hmong. They were friends and family members who didn’t like to conduct business in English, the two said. Sometimes they fronted the money, trusting they would be paid back. They said they made no profit. When the Americans pulled out in 1975, thousands of Hmong collaborators were slaughtered or fled to refugee camps in Thailand. Ultimately, about 300,000 found asylum in the United States, settling in close-knit enclaves largely spread among three states: Wisconsin, Minnesota and California. Large trespass growing on public lands remains a law enforcement target. But a 2013 federal memo promised to ignore small-scale trade states where marijuana is legal, and California set no limits on what constitutes personal use. The result: the ubiquitous 99-plant crop, enough marijuana to keep 420 daily smokers supplied for a year, but one plant below the threshold for a five-year federal prison term. There are now hundreds of them in Siskiyou County. The initiative failed, leaving the growing ban in place. “I was frightened worse than the Vietnam War, when my parents were trying to protect us,” Kao Vang said in an affidavit filed in litigation against the county. Vang said she hid in a bush while deputies cut down marijuana and took her husband to jail, and remained there long after they left. 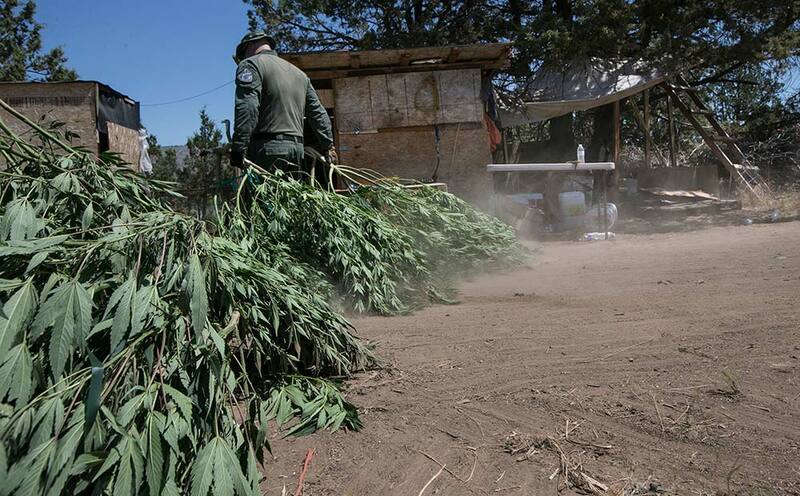 They cleared as many as three fields a day, raiding 113 grows in four months, seizing generators and water pumps and destroying 9,200 cannabis plants and 3,000 pounds of marijuana. Fifty Hmong were taken to jail. By Lopey’s estimate, the raids destroyed as much as 20 percent of the 2016 crop. The rest pops up now and then on roads headed east. In late February, a Utah Highway Patrol officer pulled over Yia Thao on Interstate 80. The officer said he found opium and methamphetamine in Thao’s glove box, and 180 pounds of vacuum-sealed marijuana in the back seat and trunk. Thao had been paid $2,000 to drive the cannabis out of California, the officer wrote. After most of the growers returned to Minnesota or Fresno for the winter, Bao Kelly Xiong and her sister, Mee Xiong hung on. The sisters lived among the tall cannabis they tended, in low huts of black plastic and empty chicken manure bags lashed with orange baling twine, their mattresses on the ground. At night they eased their aches with a rinse of marijuana stems and leaves steeped in water. Three weeks later, a 56-year-old man collapsed as he rose in an old trailer warmed by a generator beneath its floor. A third death was in December, a Laotian man poisoned by the generator beside his shed. To build support for his campaign, the sheriff has given tours of the marijuana fields, taken a state senator overhead by helicopter and driven a reporter down the bumpy roads at a fast clip, pointing out the high fences and pickups with license plates from Minnesota and Wisconsin. A request for emergency state aid to fight illegal marijuana growing is sitting on Gov. Jerry Brown’s desk. He wore a wire to record two growers who allegedly offered him $1 million to grant protection to their Missouri-bound crops. The two were charged this month on suspicion of bribery.